All of our top quality Solenoids come with a LIFETIME Warranty! Nobody Else Offers this!! Solenoids are one of, if not the most important parts of a nitrous kit. This is what stops and starts the flow of fuel and nitrous. 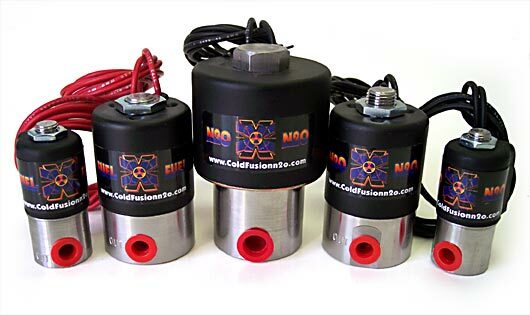 Using top quality solenoids is very important, all kinds of bad things can happen when you don't use a high quality fuel solenoid or nitrous solenoid. If you want high flowing nitrous oxide, and safe fuel flow then check out our solenoids below! Flows Up to 200 hp; .078 orifice; 1/8" inlet; 1/8" outlet. With a screen filter insert ! Top Quality Solenoid with Lifetime Warranty! Big Nitrous Solenoid: .125 orifice; 1/4" inlet; 1/8" outlet Flows up to 550HP. Top Quality Solenoid Lifetime Warranty! Monster Nitrous Solenoid Flows Up to 700 hp; .156 orifice; 1/4" inlet, 1/4" outlet. Top Quality Solenoid Lifetime Warranty! Fuel Solenoid Up to 250 HP - Top Quality Solenoid Lifetime Warranty! Fuel Solenoid Up to 650HP - Top Quality Solenoid Lifetime Warranty!